Three early masterpieces from one of science fiction's great stylists. Acclaimed, as one of the most original voices in modern literature, Raphael Aloysius Lafferty drew more from traditional oral storytelling techniques than from the usual pulp roots of SF. His inventive style and fondness for tall tales marked him out from his contemporaries, and writers of the calibre of Harlan Ellison, Neil Gaiman and Gene Wolfe acknowledge him as a major influence and force in the field. His fiction has garnered numerous award wins and nominations and he has been given the prestigious SFWA Grand Master Award and the World Fantasy Award for Lifetime Achievement. 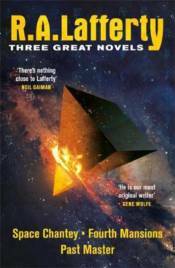 This volume contains three of his early novels: the Hugo- and Nebula-shortlisted Past Master, space opera re-telling of The Odyssey, Space Chantey, and Fourth Mansions, also shortlisted for the Nebula.